The helma4eclipse project provides a set of plugins for Eclipse, building a perspective for Helma 1.x based web app development. 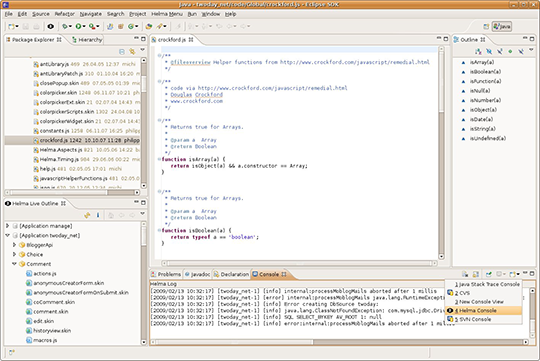 The features implemented so far by Franz Philipp Moser include a preferences pane, the ability to start/stop Helma from Eclipse, logging to the Eclipse console (you need to set "logdir = console" in server.properties) and the ability to browse the running apps, including their prototypes and skins, in a live outline. You can grab that very first version here .